We have engraved strong position in India as the sheet metal pulleys manufacturer for the reason of the unmatched quality of our pulleys. 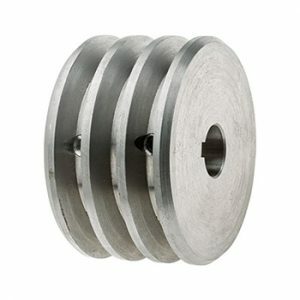 These sheet metal pulleys are available in the different metal material incorporating, cast iron, carbon steel, aluminum alloy and SS in order to meet the diverse requirements of the end user. The manufacturing is quality controlled and therefore the offered sheet metal pulley are quality compliant and ensure an unrivalled performance under the harshest conditions and is a reason for its immense popularity among the metallurgy, agriculture, food, beverage and waste water treatment industries. These sheet metal pulleys we can provide at the rock bottom prices all across India, to order contact us today.